Gazing down at my two day old son dreaming quietly in my arms, I couldn’t help but think of you. So I thought I’d write, as you always enjoy hearing about my travels and this has been quite the adventure. Our journey began on Saturday, July 6. Jamie was almost due, in the peak of discomfort and looking ready to pop. For some reason, I skipped my motorcycle ride and focused on making the perfect day for Preggers. We went for a drive to West Marin and hiked Bon Tempe Reservoir, not far from where we married. It was a beautiful day and I was impressed that Jamie was able to walk for 45 minutes. After brunch, we headed home to reading and napping, followed by a little TV time. We, no, I landed on the Return Of The Jedi, and then the contractions began! Was this more of the false labor we’d experienced last week? Jamie began timing her contractions with her iPhone app and in the meantime I got dinner on the table. Over the next few hours things progressed and soon we reached the magic 5-1-1, when contractions are five minutes apart, lasting for more than one minute and continuing for over an hour that way. They slowly got more intense and you could see Jamie working to relax and breathe her way through. By now, we’d been texting with Melissa, our Doula, who let us know that she thought this was ‘it,’ and that she was coming over to join us. What’s a Doula? I asked the same thing and was at first skeptical when I learned this would be an out of pocket expense. A Doula does a lot of things, but basically it’s a woman with experience and training to help you navigate the entire birthing process. She does acupuncture, massage, she listens like a therapist, helps plan our birth, answers my questions, attends and plays an integral part in the birth and responds to text messages pretty much 24/7. As I write this, I’m convinced that not only was she incredible, but that this was the best money I’ve spent in years. 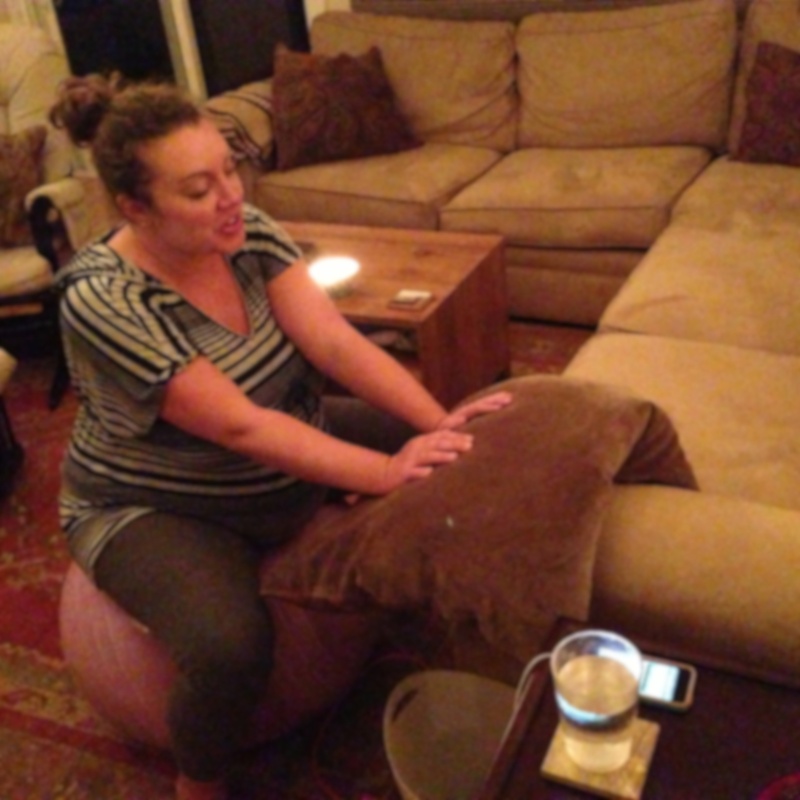 So, anyhow, I work to set the mood for Jamie with candles, meditative music and her birthing ball. This is Marin and that’s how we do things around here. Doula arrived about 10ish and by then I was ball of nervous energy, working to stay calm and support Jamie, but really running around the house doing everything I could to help out. I would’ve been lost without Doula, because as things picked up I had no experience to draw on and she just stayed calm and helped guide us along. Around 11 we packed up the car, and I drove with Jamie laid down in the back while Doula held her hand and the bucket. On arrival, I ran up the emergency room ramp, entered and announced rather loudly that “MY WIFE IS IN LABOR!” Jamie got a first class ride up to the delivery room while I ran along like a sherpa with her bags. The nurses at Marin General were great, but it was hard to keep calm with all the medical talk flying around. Plus it took a while to get an IV started b/c she was so swollen–finally we had the anesthesioligist get it in on his first try after the nurses spent a good 30 minutes poking around. After midnight we entered the birthing suite and, wow it was palatial. 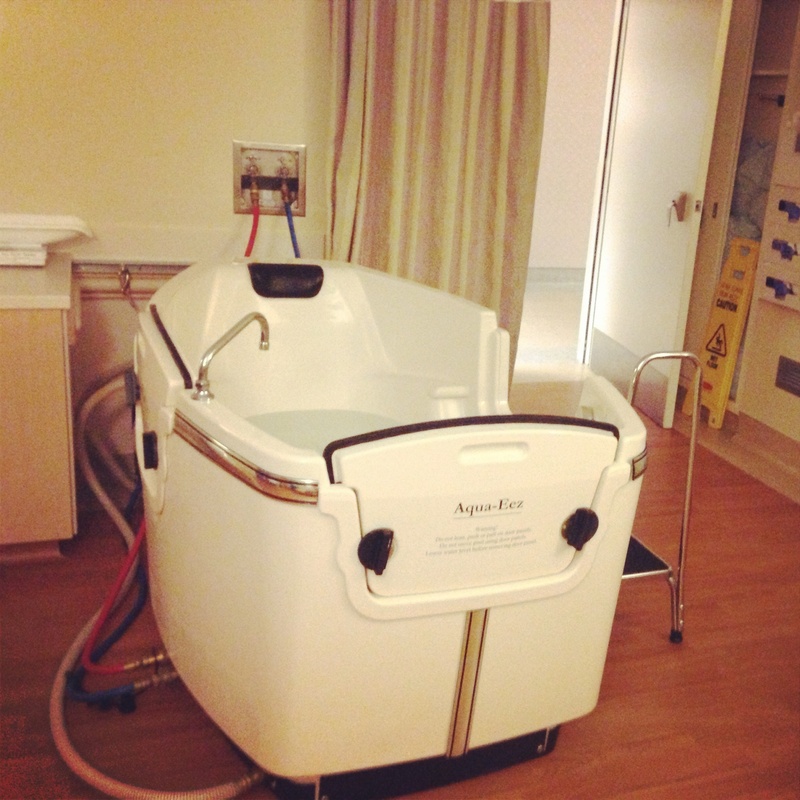 We requested a tub as my wife loves the bath and we’d heard this not only moves things along but reduces the pain. She spent a good hour plus in the tub, in the dark laboring with the Doula while I got a chance to lay down and rest. Don’t hate me for it; it was Doula’s idea and Jamie had trained me to listen to her. I couldn’t sleep because every contraction elicited a slightly stronger moan but it was nice to have a little time to retreat. By this time, I was starting to feel a little scared. 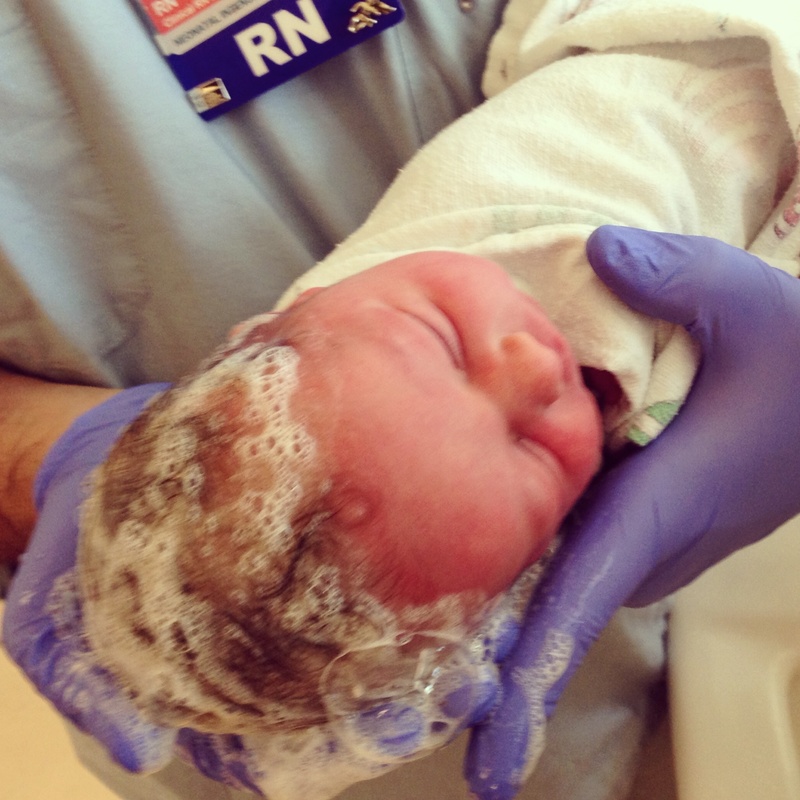 Time gets a little foggy here, but around two-ish our Midwife, Jeanmarie Crowe arrived. 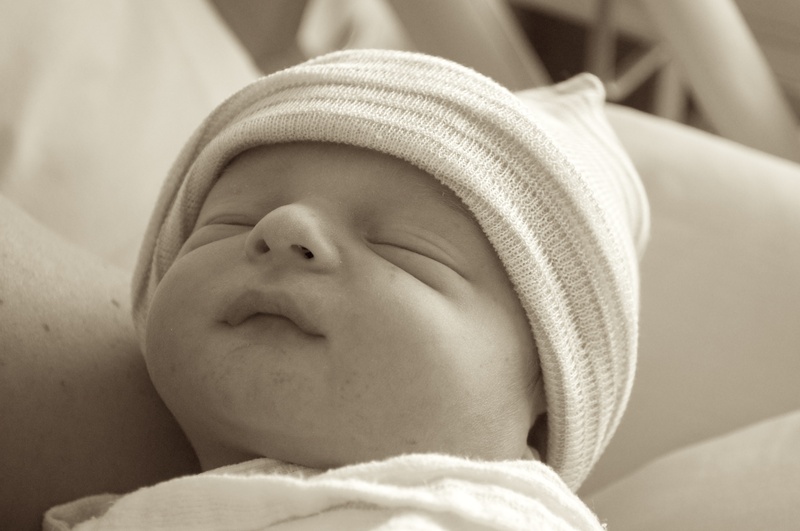 Jamie had the choice of Doc or Midwife and chose the later. She was amazing. We stood across the room while she calmly read her chart and she was able to interpret progress by the intonations of Jamie’s moans and groans. I don’t think I need to draw you a picture, but she was way ahead of schedule and soon in the bed, ready for go time. 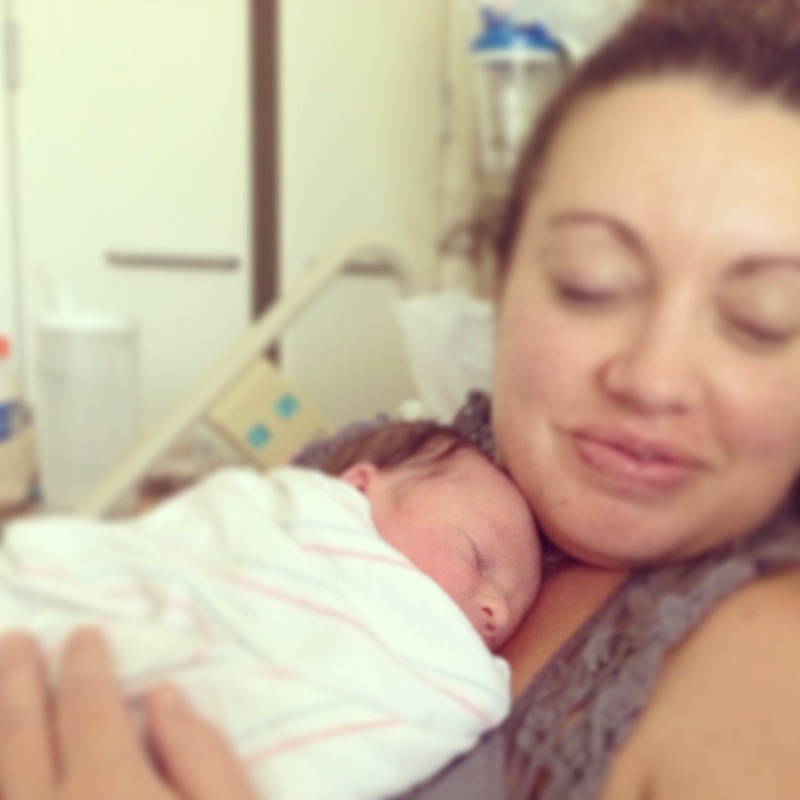 No epidural or pain meds, no doctors – it was just Midwife, Doula, a nurse and me. I now understand why they call it the ‘miracle of life.’ With each contraction our son got closer and I tried not to wince in pain as Jamie did her best to squeeze and mangle my hand. She was incredible. I’ve always known how strong she is, but, I mean, wow, this was like nothing I’ve ever seen another human do. Some friends have told me not to watch, advice I’d suggest for the circumcision, but I’m glad that I watched my son come out. At 3:26 AM Noah James was born. 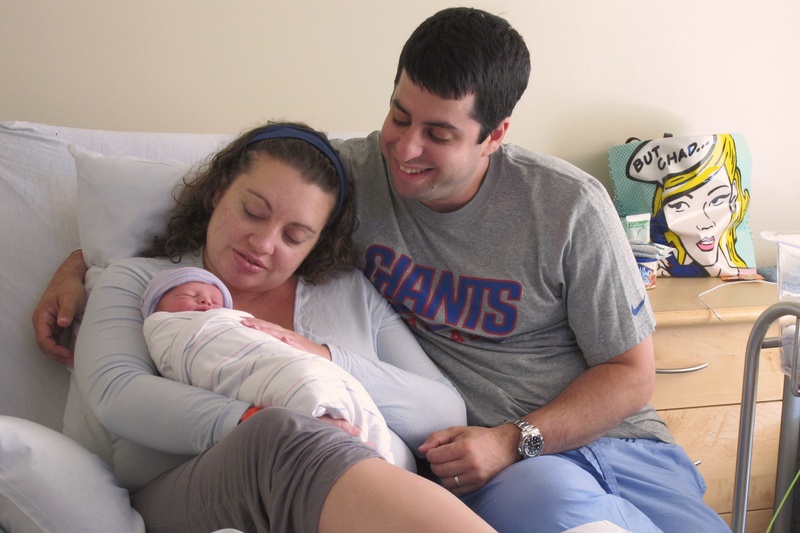 It all happened so fast, and then our child was laying peacefully on his mother’s chest. They come out covered in vernix, but he was still the most beautiful thing I’d ever seen and tears washed over my cheeks. Just like that–we were now a family of three. There’s a bunch of stuff that goes on after for Jamie and my job was to stay with our son. We’d agreed on his name months ago. We knew we wanted to honor and remember you with his middle name, and liked the way Noah James Katoff sounded, low and behold he looked like a Noah too. Soon a doctor popped in for a minute to give him a quick look over. 10 fingers, 10 toes, he passed his APGAR, and was absolutely perfect by my standards. 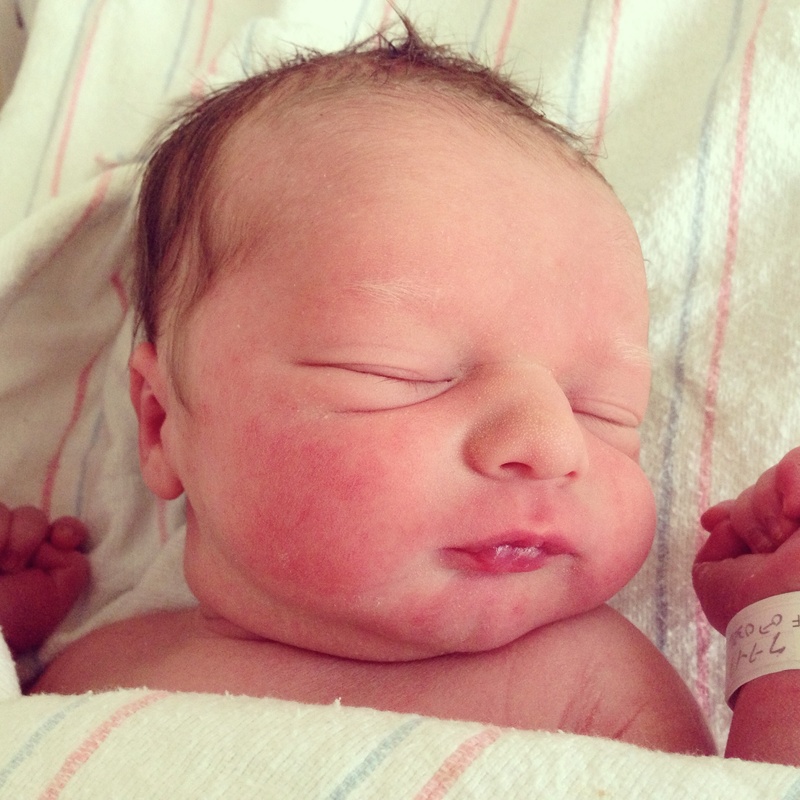 I got to hold him in my arms and sang the first Phish song that popped into my head: Driver. The next 60 hours is a whirlwind of feeding, diaper changing, and sleeping for the baby. I have so much to learn! I couldn’t help but laugh at the irony of how a child spends so much of his life convinced that his parents are ‘doing it all wrong’ and then becomes a parent himself only to wonder if he is also ‘doing it all wrong.’ Doctors, nurses, technicians, orderlies and everyone stop by constantly. Half the time I hold him he just cries, but last night, he slept in my arms for over an hour and it was pure bliss. He is so soft and smooth, and smells like heaven. I’ve already begun to call him ‘Sonny Boy’ and ‘Mister’ as you did me, and will teach him to respond to the family whistle. I texted and facebooked the world and everyone seems happy about him. Caryl and Mom both cried. People tell me he is adorable and I think they are right. Man, I wish you were still here to be a part of this. I know you would’ve gotten a real kick out of this adventure and that my boy would’ve loved his Pop. Sorry for the long letter, but you’re the one who encouraged me to write about my travels. While this was only a few miles up the road, I see it as the first few steps of a very long journey and had to share it all. So love the message. I know your dad we be off the chart proud of you. I know Noah is in his heart. All our love to you and Jamie. That was beautiful Chad, just beautiful. I think you are going to be a great father. You had a wonderful example set for you, and I think you’re going to do him proud. I know I am! Give Noah a kiss from me. I can’t believe you’re a dad either! Dad would’ve been proud of you, Jamie and especially Noah. Loved reading this Chad. Made me cry several times, of course. Also loved the part about “This is Marin and that’s how we do things around here.” 🙂 thank you for sharing!